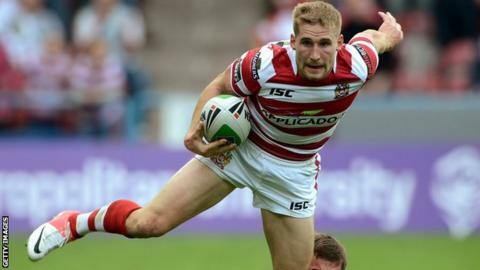 Wales coach Iestyn Harris says England full-back Sam Tomkins is the best player he has "ever seen". Harris believes the mentality of the Wigan star, who misses Saturday's Autumn International against Wales through injury, sets him apart. "Sam's the best rugby player I've seen," Harris, who played for Wales in both codes, told BBC Sport. "He's got desire and attitude in abundance. That's why he's successful, along with his skill level." Tomkins, 23, is widely regarded as one of the game's most talented players and was recently named 2012 Super League Man of Steel by his fellow professionals. His performances for Wigan, for whom he has scored 110 tries in 126 first-team appearances, has seen him linked with a switch to Australia's National Rugby League or to follow brother Joel in a cross-code move to rugby union. Ex-Leeds and Bradford half-back Harris, a former Man of Steel himself, would like to see Tomkins and other Super League players become mainstream British celebrities to boost the sport's profile. "People would see what they are like as people and the game would grow nationally because of that," he said. "I don't think we've got enough celebrities in the game like other sports have got." Wales, defeated 20-6 by France in their opening Autumn International match, are aiming to bounce back against England in Wrexham on Saturday [14:30 BST]. Sinfield - in a league of his own?